The subtle line between expectation and reality is the basic reason for disappointments and confusions in the world of embroidery digitizing. Most often, the clients don’t realize the limitations of thread and misunderstand it for ink. A thread does not have the creative liberty as that on an ink. This inadequate knowledge about the use and final practical results of digitizing and thread result in the loss of the client and disappointment for the digitizer. It must be kept in mind that not every design, no matter how tempting, is meant for embroidering as a clone. However, there are few tricks out there for the embroidery digitizers to make the client’s wishes come true but they don’t work in their favor every time. In order to keep good reputation of your embroidery digitizing service and the client intact, we must know about the problem areas and how to deal with them. 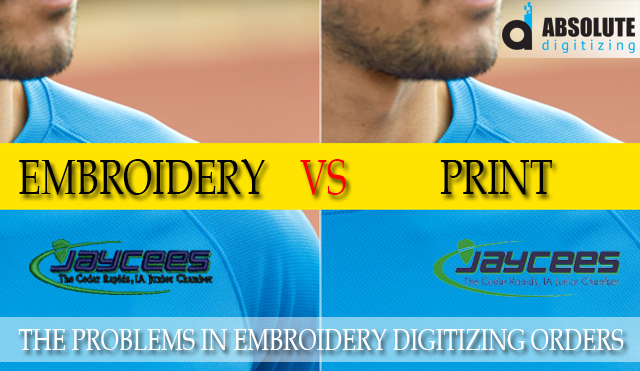 Here, we will talk about the dos and don’ts of digitizing for embroidery. It is easier to play with light and shades with tangible mediums like inks. But, it gets tricky when it comes to digitally creating the blending color effect with a thread. The same effect can be created on digitizing software just like printing but translating it into thread work would be a totally different story. The first thing to do when you receive such tricky order is to educate the client about the possible hitches in the final outcome. The client must be aware of the variation which might happen in the final outcome and how the result is conditioned with different variables. The final product will depend on the choice and quality of thread colors. It will be more about how the threads will shine and create the effect of reflection. The distressed effect is the most baffling of all tasks and technically we should have placed it in the beginning but never mind. Don’t venture into distressed effect logos unless you are sure about the process and paid well for the digitizing job. It is almost impossible to replicate the effect for embroidery. It involves a lot of work including random tweaking stitches, trying the final result on the actual garment, sampling, re-sampling and so on. The only best part is that it is supposed to look rough but that rough effect has a science behind it. Don’t mistake it for random art. There is also a massive decision of leaving empty spaces which could be filled later on or they would cut holes in the fabric. Logos are extremely popular adornment on caps and most of the orders digitizers receive are for hat embroidery. It may sound simple but it comes with its own pros and cons. The maximum height of design on a cap is 2.25 inch but if it is pushed beyond that then you are chartering into a troubling territory. Embroidery Digitizers must recognize the difference between a workable design and an impossible design with broken machine needles and entailing the loss of caps. You would have always noticed that most recognized companies have simple logos. They are not only easy to produce but from the marketing perspective, they leave a better impact on consumers. Look at Nike’s and Calvin Klein’s clean and simple logos. They obviously have a better impact than cluttered lettering. Since your job is not to design but digitize so all you can do is to inform the client about its possible outcomes. You can counsel them into deleting the outer ring and smaller lettering. Or, they could save the bigger designs for jacket backs and switch to some simpler solution for the hats and caps. As the famous saying goes that less is more. It is apt for the digitizing world especially when it comes to overdoing lettering. It is a pivotal part of a digitizer’s job to enlighten the customer that what design will work in their favor and what won’t. When too much small or tiny lettering is given to fit into an area as small as 2.5 inches then you should know better that it is a call for trouble. 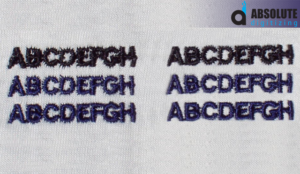 An improper letter sew-out is the most punishable mistake of a digitizer’s career as everyone would promptly notice it. So, advise a better alternative to the client or refuse the job to avoid any inconvenience. Our experts are always open to your queries. You can contact us for free expert advice.